Were Empires Better Than Nation-States at Managing Diversity? 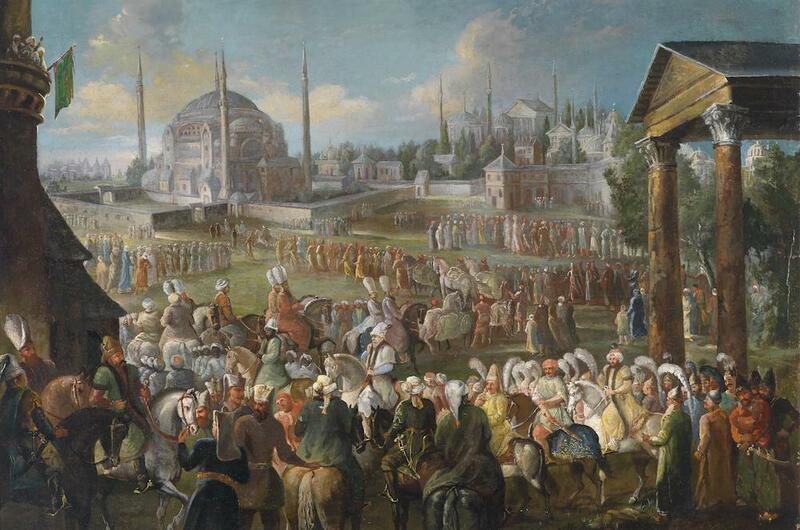 Procession of the Sultans in Istanbul, by Jean Baptiste Vanmour (1671-1737). Image courtesy of Wikimedia Commons. Did empires actually serve to protect the diversity of their subjugated people? And if so, what lessons can they offer for the challenges facing modern states? Answering these questions might begin with the Spanish conquest of the New World in the 16th century—a moment that changed empires forever, because the Spanish empire became global then in a way that was not possible earlier. Although Alexander the Great constructed a vast Eurasian empire, and the Roman Empire regarded itself as ecumenical, neither of them incorporated the enormous variety of peoples and cultures to be found in Spain’s empire. And that variety was also characteristic of the other overseas European empires—the Portuguese, Dutch, French, and British—that would follow it. This presented the rulers of these global empires with novel problems—most pointedly, the problem of managing diversity. Differences among the subject peoples of these new global empires called for new ways of thinking about empire. Initially, European rulers were very conscious of following in the tradition of previous empires, which are among the most enduring political forms in human history. In particular, the longevity and achievements of the Roman Empire made it an exemplary empire for most of the European empires (including the Ottoman). The continuities with the past were evident in how the European empires preserved the idea of universality. Though the existence of other empires was usually recognized, all empires tended to think of themselves—like the Roman Empire—as unique and universal, carrying a special truth about the world that they felt entitled and even obliged to carry to the whole of humanity. Usually this sense of special truth took the form of belief in the imperial mission, and it was often expressed in religious terms. Thus, the Spanish and Austrian Habsburgs saw themselves as the vehicle for Roman Catholicism throughout the world. The Russians justified their empire for its spread of Orthodoxy; the Dutch and British saw themselves as the champions of Protestantism; the Ottomans were the carriers of Islam. In later years, as secularism became more pronounced in Europe, the imperial mission was conceived in less religious terms—and instead as the “civilizing mission” of the European powers, through which they spread the ideals and practices of Western civilization. Often this was coupled with the idea of imperial citizenship—the incorporation of all the subjects of the empire into a common citizenship, which they shared with the ruling people. The ideas of universality, the civilizing mission, and common citizenship were all taken from Rome. But the modern European empires, especially the overseas ones, were also conscious that the peoples over whom they ruled possessed very different traditions and cultures from Western ones, as well as from each other. And so, though convinced generally of the superiority of European civilization, they proceeded with caution. In the interests of order and efficiency, the promotion of the imperial mission was tempered by a recognition of the need to respect the traditions of the subject peoples. Often empires took the lead in preserving and conserving local cultures, studying the local languages, propping up indigenous institutions, and excavating and restoring often lost or decayed historical sites. This work of conservation and recovery was often done in the spirit of scholarship and intellectual inquiry. But it also had a more strategic purpose: managing diversity in far-flung empires where attempts to impose cultural uniformity might create resentment and resistance. Such considerations also affected how the ruling peoples of empires responded to nationalism, which from the time of the French Revolution onward became a powerful force—first in Europe and then increasingly in the rest of the world (not least through the global reach of the European empires). Nationalism, which demanded that state boundaries coincide with national ones, was a threat to empires, which were almost by definition multinational and multiethnic. What made the threat all the greater was that empires themselves had often been responsible for the spread of nationalism, not only through their cultural policies of conservation, but also via educational systems that had led to the creation of a class of indigenous, westernized intellectuals who demanded a place in imperial rule—if not outright independence for their nations. Ultimately, what brought down the empires was not nationalism. Their fall was mostly the result of two World Wars, which were fought mainly among the empires. Indeed, empires could use nationalism for their own purposes; some were particularly adept at exploiting the divisions and conflicts between the many nations that composed the empire. The Habsburg Empire, for example—from 1867 the “Austro-Hungarian” Empire—contained Germans, Hungarians, Czechs, Poles, and Ukrainians who often saw each other as threats, and looked to the Habsburgs to preserve the peace and provide orderly administration. Muslims and Hindus in India long looked to the British Empire as a protective agency, inhibiting communal rivalries. The modern European empires, especially the overseas ones, were conscious that the peoples over whom they ruled possessed very different traditions and cultures from Western ones, as well as from each other. While managing the nationalism of the subject peoples was one thing, imperial rulers also had to be equally alert to the nationalism of the ruling peoples themselves, and to rein that in where necessary. Allowing the nationalism of the ruling people to express itself too strongly would have been a profound irritant to the other peoples in the empire, and a dangerous provocation. The ruling people—English, French, Austrians, Russians—got their sense of themselves through their imperial, not their national, identities. One effect of empire, therefore, was a critical suppression of the national identity of the ruling peoples—a diminishment of a sense of themselves as a distinct nation. So long as the empires survived, this was not a problem for the ruling peoples, engaged as they were in the enterprise of imperial rule, and content with the identity and the spoils that this gave them (despite the high costs of empire). Once the empires had gone, though, imperial peoples were faced with a profound question of who they were, of how to find the national identity that they had previously ignored or suppressed. Empires now seem to have gone, at least in a formal sense, and no one claims to be re-establishing an empire. Empire itself has become a dirty word; and if anyone practices it—Americans or Russians, as many have suggested—they call it something else. But the nation-state, empire’s successor, has proved to be an awkward and in many ways unsuccessful form for dealing with the problems thrown up by multiculturalism and globalization. Its principle of “one people, one state” has turned out not to be (as 19th-century theorists hoped) a recipe for peaceful coexistence in a world of equal nations; but as a prescription for an unending cycle of violence, bred by the existence of national minorities in most states. In such a condition—which we find ourselves in today—empires may have much to teach us about the management of difference and diversity, and of the recognition of principles that go beyond the limited vision of nationalism and the nation-state. Yes, it’s true that empires have had their day. But when they were the norm they covered the earth and they lasted for hundreds, sometimes thousands, of years. At the very least their study is likely to prove highly instructive. Krishan Kumar is a professor and sociologist at the University of Virginia and the author of Visions of Empire: How Five Imperial Regimes Shaped the World (Princeton University Press, 2017).